Nearly a year ago, Eightloops made a little bit of noise when it announced Unibox, promising “something new” for people yearning for an email client other than OS X’s built-in Mail.app. But after the end of 2012, the company went quiet, and followers voiced their frustration on the company’s Facebook page. The silence is finally broken: Eightloops has announced sign-ups for a private beta of Unibox, which will distribute the app to a small number of people to test, with the hopes of releasing the finalized version in the Fall. Here’s a quick look at what that beta offers, with the caveat that, like all betas, this is a work in progress. 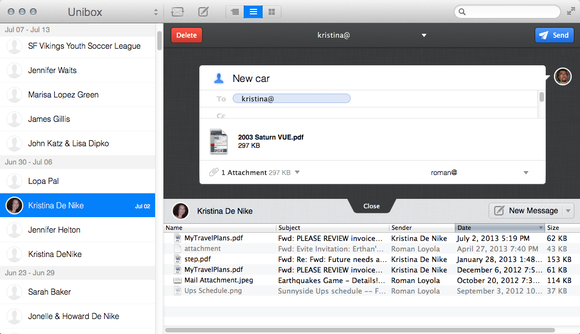 Eightloops says on its website that Unibox has a “people-centric approach” to email. The idea is that, unlike OS X’s Mail, which focuses its message handling on the messages themselves, Unibox organizes its messages based your contacts. After you launch Unibox and add your accounts, you’re greeted by the main user interface: The default view shows a list of people you’ve received email messages from; if they’re in your Contacts app and have a photo, Unibox uses that picture next to the contact name. Click on a contact, and you see a list of messages in the large pane to the right. When you mouse over the bottom of a message, a More button appears, letting you display the rest of the message, along with other action buttons, such as delete, forward, and reply. At the top of the right pane is a set of three buttons. The left button switches to the default message view. The other two buttons, curiously, show only the attachments sent to you by the contact; the middle button shows a list view of attachments, the right view shows a thumbnail view. The second attachments view shows thumbnail previews. When you want to create a new email, click the pen/pad icon at the top, and a new email window slides open at the top of the right pane. This is a beta of Unibox, so as I said, it's possible—and likely—that some changes will be made before the software is released. 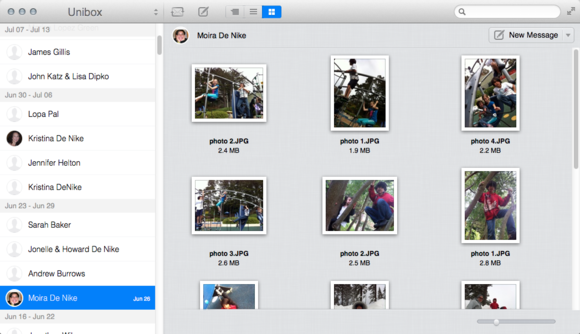 Macworld will have a full review of the final version when it is available. If you’re interested in testing the beta, you can sign up at uniboxapp.com/beta. 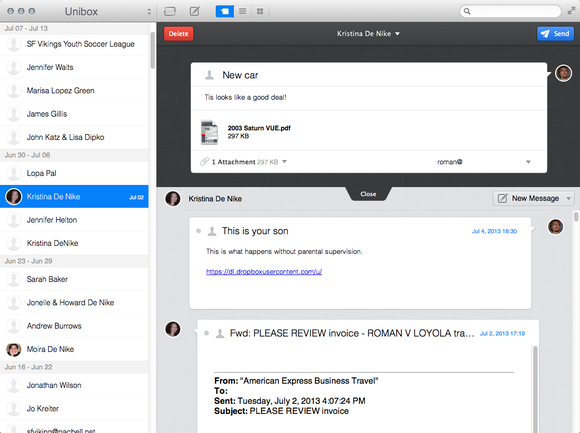 Unibox, with its unconventional take on email, stands out from a crowd of look-alike email clients.